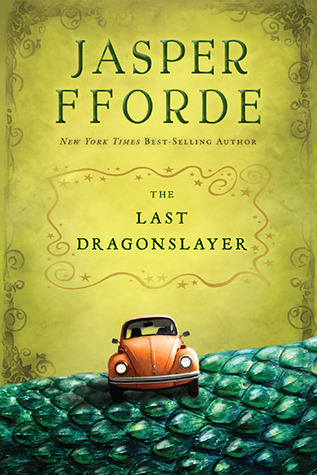 The Last Dragonslayer, by Jasper Fforde – This is the first volume of Fforde’s newest series, geared toward a young adult audience and featuring such fantasy tropes as dragons and magic. Like Fforde’s other series, it takes place in another alternate world, this time one in which Britain was never united and magic is real, but weakened to the point where sorcerers are now delivering pizzas and fixing plumbing. The main protagonist, Jennifer Strange, runs an employment agency for magicians, which is home to some odd characters. Through a strange series of events, Jennifer also becomes the last in a long line of Dragonslayers, whose job is to kill dragons if they violate the Dragonpact created by a wizard from the past named Shandar. The position comes with a sword that can cut through anything and a Rolls-Royce, but also responsibilities that often seem to conflict. I felt that the changeover from the magic agency to the stuff with the dragon was kind of abrupt, but I suppose Fforde wanted to introduce as much as possible of this new world. I feel I should also mention the Quarkbeast, an amusing magical creature who accompanies Jennifer on her adventures. I’m definitely going to want to read more about this world, but it looks like the next volume won’t be out in this country until next year. This entry was posted in Authors, Book Reviews, Chronicles of Kazam, Jasper Fforde and tagged dragons, jennifer strange, quarkbeast, the last dragonslayer. Bookmark the permalink. The only thing I’ve read by Jasper Fforde was the first Thursday Next novel, The Eyre Affair, which seemed like the sort of book I really should have liked, but it just didn’t feel very believable to me, as far as fantasy worlds go, unlike the sort that Rowling or Tolkien created. It had a lot of cool concepts, but they didn’t come together in a way that allowed me to suspend my disbelief as better written fantasy books manage to do. It seems like the author has enough interesting ideas that I’m almost tempted to want to give his writing another chance, though. Fforde has a tendency to want to cram everything into his books, which I found confusing at first. He has the idea that people can travel inside books, which could be a decent fantastic concept in and of itself, but then adds other fantasy and science fiction elements to the real world. So, yeah, I can see the sum total of all this not being particularly believable. I do think it might be worth trying another book of his, though. I think they do get better.